Browntrout has been on my radar for a long time, and it only made its way higher on my list with Chicago Magazine best new restaurant 2010 and the recently announced Michelin Guide Bib Gourmand award. 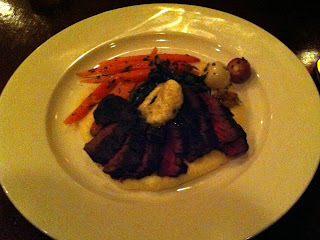 We decided to check it out on a Wednesday night when they offer make your own three course meals for $35. However, even after the good value and great service, I felt the food did not live up to all the awards. Everything we had was good, but nothing ever crossed into "great" territory. Don't get me wrong, it performed well across the board and was consistent throughout. I appreciate the sustainable food mission, the inviting decor and good drink list, however I just wasn't wooed by the food overall. 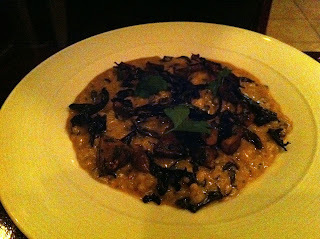 We started with french fries and mushroom risotto. 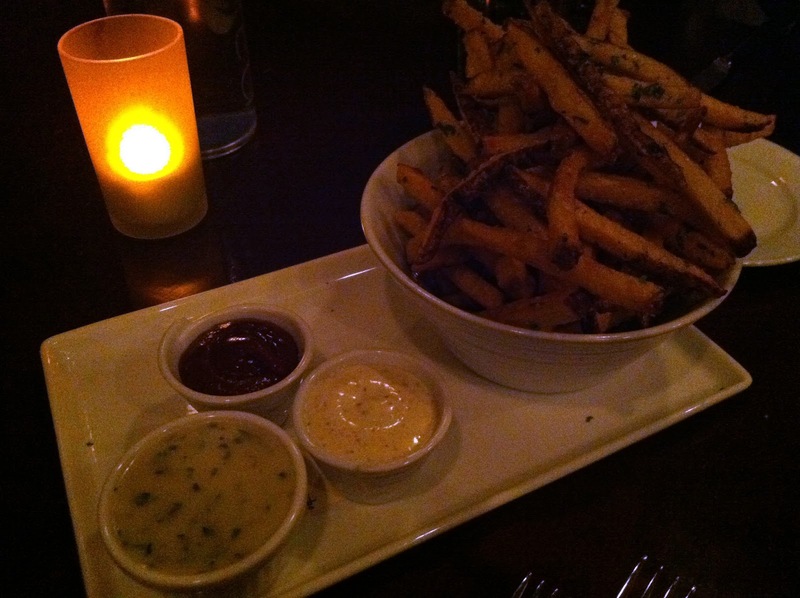 The fries are served with melted cheese "fondue", house made ketchup and mustard. It's a large portion and hard to stop eating. The ketchup was my preferred sauce. Erica did most of the work on the risotto (and liked it) since I'm not a huge mushroom fan, though I thought it lacked flavor (outside of the truffles) and missed the great risotto consistency. Our main courses was a mix of surf and turf, Erica ordered a steak and I went with fish (I'm blanking on what kind and it changes frequently). My fish was fine, like the rest of our meal, tasty enough but nothing special. Erica's meat was better and quite good. Each dish came with roasted vegetables and a nice sauce. 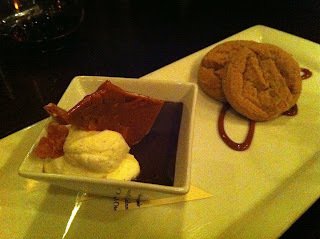 Finally, we ended our meal with a chocolate mouse like dessert served with peanut butter cookies. I wasn't expecting the chocolate so chocolaty (not their fault) but the cookies and caramel were very good. Our drinks all night were good and fun and our service was great. Even with the prix fixe option, I was a bit surprised our bill topped $110 all in. If I sounded a bit harsh at first it is more a reflection of expectations not met. 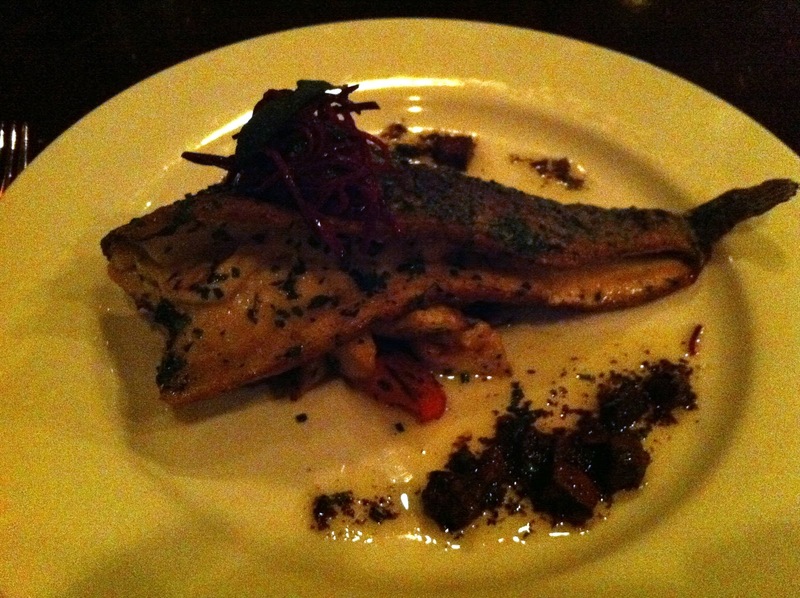 I think the concept and service at Browntrout is solid and dependable, though the food is not exceptional. I'm a little confused on the value (especially with Michelin), but it does make a nice neighborhood family spot for meals out.